After a brief ceasefire, the federal push to adopt electronic records has spurred a new round of fighting as hospitals, ROI vendors, and lawyers tussle over pricing. It could be said that the more things change, the more they stay the same. While rapid advancements in technology have revolutionized the way many people do business, perhaps a more profound change has occurred in the perception that now anything is possible. Unfortunately, perception often lags behind reality. For example, in the medical records industry, technology is changing the notion of what constitutes reasonable fees for copies. The problem, many in the industry say, is that technology’s capabilities haven’t yet caught up to expectations. This difference is stirring up some old arguments about how release-of-information (ROI) fees should be calculated. Patients are charged for their medical records only in situations where they want a copy for record-keeping purposes, such as if they’re moving out of state. If a patient needs medical records as a result of ongoing treatment, those records are provided with no charge. Insurance companies and trial lawyers who want medical records have to pay. Trial lawyers play a large role in this debate because rather than one or two medical events, they are likely to request every record that a patient has ever generated, which can lead to sizable fees. In the early 1990s, this led to a push from trial lawyers for cost control, which was met with a push back from medical facilities and ROI providers that have to pay staff to process the records. Since then, the battle over medical record fees has become the ROI version of the Hatfield-McCoy feud, and it’s not likely to end soon. 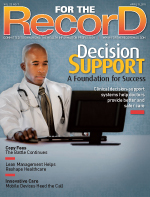 Trial lawyers say the costs of medical record copies are prohibitive. Medical facilities counter that ROI is a labor-intensive process. At times, the debates have been heated, fueled by the well-established lobbies backing each side. For this reason, medical record fees are legislated in most states. If this process seems disjointed, that’s because it is. But without an overarching cost structure, the only way to fight these battles is state by state, which increases the cost of following the rules for companies that do business in multiple states. The patchwork of state laws is only part of the problem, though. HIPAA adds another layer of rules. Rather than preempt state laws, HIPAA provides only an additional framework for fees. Section 164.524(c)(4) stipulates that states can charge “a reasonable, cost-based fee” that may include the cost of supplies and labor for copying, postage, and costs associated with preparing an explanation or summary. Since it does not actually set fees, what constitutes a reasonable fee is open to interpretation. A federal law would help ROI entities by simplifying fee regulations, while trial lawyers would benefit by gaining cost certainty. However, it doesn’t seem likely to happen. Part of the problem with that approach is that labor costs vary across the map. While the existing legal structures are nothing new, what is new is the growing adoption of EMRs. With the HITECH Act, the federal government put a premium on electronic storage and transfer of medical data, touting its potential to improve patient care, reduce duplication of services and, most importantly from an ROI perspective, reduce paperwork and the costs associated with storing and tracking it. However, that potential remains largely untapped. Most facilities are still feeling their way around EMRs and are mainly concerned with integrating the new technology into their workflow rather than being ROI friendly. Some outside the industry has seen the move away from paper as a harbinger of easier processing and lower costs. But the savings from eliminating paper are not substantial; Logan estimates they’re about a penny per page. Switching to digital doesn’t save time either. “It changes the delivery method, but that’s about it,” says Jan P. McDavid, general counsel for HealthPort, an ROI outsourcing provider. “All of the work that has to be done prior to actually duplicating the record is the same. There are 30 or 40 steps that have to be followed in terms of verification, authorization, and the application of various statutes and regulations to every request. It is possible that EMRs may make ROI faster and cheaper one day, but Wickman says that day is far in the future. For the short to medium term, digital record keeping may increase ROI’s degree of difficulty. One reason for this is the digital landscape of most hospitals. Logan points out that for various reasons, hospitals have chosen to spread digital records across multiple databases. There may be different repositories for lab reports, order entries, physician summaries, or any number of records relating to a single patient. And when hybrid environments—the most prevalent among institutions—are factored in, the process becomes more time-consuming and costly. Hynes says the cost of hybrid records can be represented by a bell curve. Facilities that use paper only are at one end, and facilities that are completely paperless are at the other. In between, various combinations of paper and digital data combine to make the ROI process more labor intensive. The fluid nature of moving from one stage to the next means that tiered pricing would be cumbersome. Although labor is the biggest driver of medical record fees, there are other considerations that need to be sorted out. Coffield says that as a defense attorney representing hospitals, any costs he incurs are billed to the hospital. So, essentially, the hospitals are billing themselves for medical records when they defend malpractice claims. Whether this warrants a change in policies is something hospitals may want to consider. Another question for hospitals is how to handle PHRs. Although hospitals are allowed to charge patients for copies of their records that aren’t related to ongoing care, should they? The HITECH Act’s consumer-driven agenda puts a new variable into the equation: Charging patients for records could slow down PHR adoption. And while digital technology has not reduced labor costs, it has already changed workflow. Coffield believes lawyers will eventually start asking for records in the original digital format so they can see the data as they looked during the patient encounter. He says the technology isn’t ready yet, but when it is, the requests are sure to follow. How the HITECH Act’s changes are reconciled with the HIPAA requirement to provide patients with a copy of their records will be an important factor in how this plays out. The Office of the National Coordinator for Health Information Technology and the Office of Civil Rights are expected to release rules later this year that clarify how access to digital records should be handled. Although digital technology will undoubtedly change the rules for ROI, it will probably be less of a factor in determining fees. Whether completely eliminating paper will eventually bring down costs is anybody’s guess. But no matter how the records are delivered, there are steps in the process that can’t be automated. — David Yeager is a freelance writer and editor based in Royersford, Pa.